Nonprofits often rely on their donors to keep their organizations afloat. Donations often contribute a large part to the resources that are needed to keep you up and running. With this in mind, it makes sense to invest time and thought into your website’s “donate” button. A great “donate” button should capture someone’s attention right away and be easy to locate. Optimizing your donate button, your website, your landing pages, and your donation page will lead to an increase in online donations. In essence, your “donate” button should act as an invitation for your website visitors to support your nonprofit. 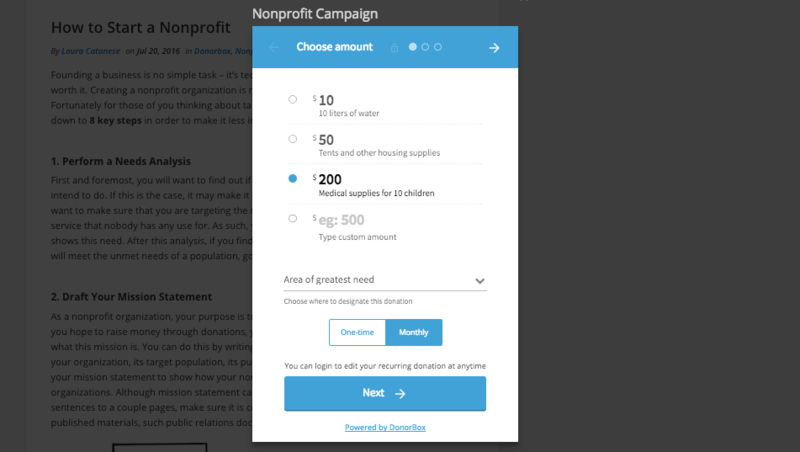 A donate button for a popup modal form. With the secure donation page, you don’t need to install any additional SSL on your website. If you want to use a popup modal form, make sure that your website is SSL secured. Go to Donorbox.org and sign up for a free account. Set up a Stripe or PayPal account to receive donations/payments. Head over to your Donorbox dashboard and find the campaign you wish the “Donate Button” to link to. Click the “Donate Button” to the right of that campaign. This is where you can customize the look and settings of your Donate Button”. Make whatever changes you need to. You ‘ll notice the code in the code box adjust itself as you make changes. Copy the code from the code block. Head over to your website editor (we will be using a WordPress website as our example). Find or create the page on which you wish to add your “Donate Button”. Once you’re on the page that you want to add the Donate button on, select the text editor (as opposed to the visual editor). Paste your “Donate Button” embed code (that you copied in Step 4) in the appropriate text box. Publish the page, and you’re all set! Clicking on the donate now button will take you to a secure donation page such as the one below. In addition to the secure donation page, Donorbox offers the popup modal form as another option for the “Donate Button” integration. This means that instead of redirecting your donors to a separate donation page, you can make it so that a donation form pops up on the same screen when someone presses your donate button. For more details on how to install this please check out our modal installation guide. You will need to install SSL on your website in order to use our pop-up modal form, in order to ensure the security of your donors. Your donate button should stand out from the rest of your website immediately. Put your donate button somewhere that doesn’t change as a user navigates your website. Colour is the other important factor, and just as bigger buttons seem to have benefits, so do brighter ones. Keeping the message short and simple is the way to go. Use color. Colorful, high-contrast donate buttons are more eye-catching and perform better. Include a short, compelling message right above the donate button. This can be helpful in convincing donors who are still on the fence. Incorporate your donate button in everything from your blog to your emails. Use white space on your donation button. This can command attention and successfully have your donation button stand out on your website. Fantastic beat ! I would like too apprentice while you amend your website, how can i subscribe foor a blog site?